Today, you can learn to make your very own Japanese-style fried rice, Shogun Fried Rice Recipe. The hibachi-style or shogun style fried rice is a simple menu derived from Japan. It is very similar with the Hongkong or Chinese fried rice because the main ingredients are soy sauce and butter. In many parts of Asia, fried rice is a leftover dish. 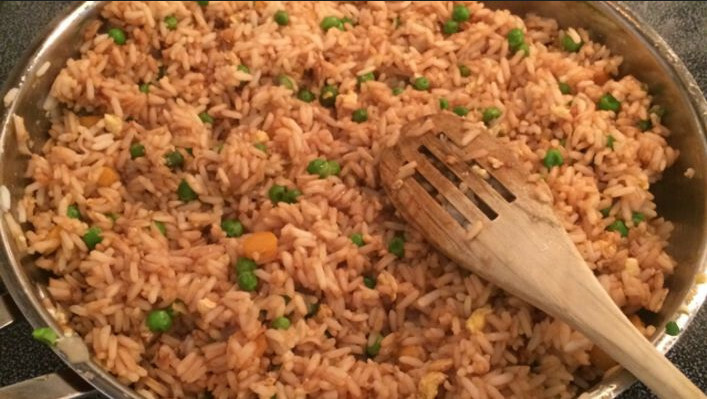 By using parts of leftover meat and/or vegetables, you can easily put them for fried rice. The best recipe is made from the rice that has been cooked and a bit hardened overnight. The rice can soak so many flavors. In order to prevent it for getting too soaked and soggy from the soy sauce, oil and other ingredients, it is best to use the overnight rice. Japanese food is known for creating an extraordinary dish with the simplest of ingredients. Well, Shogun Fried Rice Recipe is no different. You can use freshly cooked rice and vegetables. So basically, it is very different from your typical “leftover” fried rice. Pour the rice, peas, carrots, canola oil and egg. Cook it for 5- 7 minutes in medium heat. Serve immediately. Fully cooled or day-old rice works best for Shogun Fried Rice Recipe. It doesn’t clump together or soggy. In Japan itself, Yakimeshi or fried rice have several varieties. Omurice is served with a special omelette on the top of fried rice. The sauce in Omurice is different since it doesn’t use your typical soy sauce. Instead, it uses a soy sauce and garlic based with a hint of dashi on the side. Another Japanese style menu is garlic fried rice. This one is very similar to Hibashi-style fried rice, but it underlined the flavor of garlic. Another point that you might realize is the use of meat in this dish. It doesn’t contain any meat at all. You can add any sorts of meat, but chicken is preferable since chicken is quick and easier to cook rather than red meat. You also need to add more ingredients for cooking the fried rice with chicken. Moreover, if you like a more kick to it, then add spicy mustard while cooking. Hot sauce also makes a great alternative for adding spiciness. You may tweak this recipe anyway you like. You can add more vegetables such as spring onion. Well, the best way to eat Shogun Fried Rice Recipe is based on your preference. Related Post "Shogun Fried Rice Recipe, the Simplest Japanese Style Fried Rice"